Mt Kailash Tour is the most visited sacred destination in far-west inTibet and Hindus believe Mt Kailash to be the abode of Lord Shiva. It is considered holy center of the universe among both Hindu and Buddhist religious group. Mt Kailash Tour drawn to many pilgrimage groups from all over the world to have divine glimpse of Lord Shiva’s abode to attain release from the clutches of ignorance and delusion. Mt Kailash Tour along covers circuit around the holy mountain-clockwise for the Buddhists, anti-clockwise for Bon adherents are known as a Kora or Parikrama (Circuit) and normally it takes three days. Along the Mt Kailash Tour visitors take a short plunge in the nearby sacred site Manasarovar Lake. According to Buddhist scripture Lord Buddha had magically visited Kailash in the 5th century BC and they also believe the Buddhism was entered in Tibet from Nepal and India, in the 7th century AD afterward. Mt Kailash Tour allow to visitors to wonder about magical natural rewards of around and colorful reflections of religious belief of people. The groups of people still believes immortal Hindu Lord Shiva lives at Kailash where he had spent his time practicing yogic austerities, making joyous love with his divine companion Parbati and smoking sacred herb marijuana (ganja). Day 06: Drive to Manasarover (600 k.m.) 4558m. Day 13: Drive via Zhangmu and across Friendship Bridge to Kodari border We then drive back to Kathmandu. Day 01: Kathmandu (1300 m.) arrival and transfer to hotel in kathmandu. is the largest stupa in Nepal and the holiest Tibetan Buddhist temple outside Tibet . It is the center of Tibetan culture in Kathmandu and rich in Buddhist symbolism. The stupa is located in the town of Boudha , on the eastern outskirts of Kathmandu . Day 03: Drive to Nylam (150km), 3750m: Morning after breakfast drive Kathmandu to Nyalam (3800m). We drive to Friendship Bridge [Nepal – China Boarder]. Walk along for 10 minutes to cross the bridge. After accomplishment all the immigration and custom formalities meet Chinese guide and land cruiser drivers, then processed the journey to Zangmu, and Nyalam. Arrival at Nyalam and overnight stay in a guesthouse. Day 05: Saga/4450m: (Labug-La 5050m, Peku-tso and Saga, 245 km) On the first long driving day over the sandy and rocky land of Tibet, other sites like lake, nomads chasing thousands of yaks and sheep, keep you busy. By the late afternoon you will cross Bhramha Purtra River on the way to typical Chinese and Tibetan town. Overnight in Saga. Day 06: Drive Paryang to Manasarover (4558m) 600 km: The longest driving day starts with full of excitement, by the late afternoon you can have the first sight of Holy Kailash Parbat and Manasarovara. Hore, it is a small village nearby LakeManasarover. Holy-Manasarovara: At 14950-ft/ 4558m. The highest lake of fresh water with turquoise complexion in the world is full of fishes and swans. Holy Kailash Parbat, Mt. Gurula-Mandata, Lake Rashekshi are laying on its surrounding. The region is considered rich for gold and other mines, hot springs and hundreds of wild living creatures. Night halt beside Manasarovar. Day 07: Puja and drive to Tarchen (14975ft): Manasarovara is the lake of compassion, tranquility and bliss. After completing the memorable morning Bathand Puja we will be heading towards Tarchen. It is considered as a base camp for the Holy Kailash Parikrama. Day 08: Trek to Dehara Puk/5000m: It is one of the exciting days walking along the beautiful rocky cliffs; waterfalls with some clouds in the clear blue sky makes you feel the Great God Shiva is everywhere with tons of blessings to you. Time to time the face of Kailash Parbat will keep on appearing. For 18 km trail it takes almost 7 hrs. Day 09: Hardest but Holiest day of your pilgrimage Yatra with Dolma-La (pass) of 18600ft between two valleys: Yamasthal should be crossed to reach the Shiva-sthal, here there is the symbolical death, Pilgrimages leave the Old clothes, spin of hair or a drop of Blood in hope, that terrible Yamraja (The master of death) will attention to these signs and will allow the Yatries (travelers) to be born in spirit to pass Dolma- La. The pass associates at Buddhists with the goddess Container, and at Hindu with Parvati, divine wife misters Shiva. On the pass tourists and pilgrimage hang out the Tibetan flags, On success. While your steps goes closer to the pass, Once you reach the top, just do the holiest offerings and sit down for meditation to forget yourself. Once your steps go down, Parvati-sthal and Gauri Kunda are on the way. By the late afternoon you will arrive at Zuthal Puk (the cave of Miracles. The great ascetic Milerappa is supposed to have performed miracles here). Day 10: End of Kailash Parikrama and drive to Manasarovara: After walking 3 hours, all the driving crew will be waiting for your arrival. By the late afternoon you will be at your camp beside the Lake Manasarovar. Day 11: Drive Manasarovar to Dongpa or Saga (460km)/overnight rest at hotel. Day 12: Drive Saga to Nylam or Zang Mu: (296km) /overnight at guest house. Day 13: Drive back to Kathmandu (150 km) /overnight at hotel. Mount Kailash is a peak in the Gangdise mountains which is part of the Himalayas in Tibet, the source of some of the longest rivers in Asia—the Indus River, the Sutlej River (a major tributary of the Indus River), the Brahmaputra River, and the Karnali River (a tributary of the Ganges River) — and is considered as a sacred place in four religions — Hinduism, Buddhism, Jainism and other faith. In Hindu religion, it is considered to be the abode of Lord Shiva. The mountain lies near Lake Manasarova and Lake Rakshastal in Tibet. There have been no recorded attempts to climb Mount Kailash; it is considered off limits to climbers in deference to Buddhist and Hindu beliefs. It is the most significant peak in the world that has not seen any known climbing attempts. A great mass of black rock soaring to over 22,000 feet, Mt. Kailash has the unique distinction of being the world’s most venerated holy place at the same time that it is the least visited. The supremely sacred site of four religions and billions of people, Kailash is seen by no more than a few thousand pilgrims each year. This curious fact is explained by the mountain’s remote location in far western Tibet. No planes, trains or buses journey anywhere near the region and even with rugged over-land vehicles the journey still requires weeks of difficult, often dangerous travel. The weather, always cold, can be unexpectedly treacherous and pilgrims must carry all the supplies they will need for the entire journey. How long have people been coming to this sacred mountain? The answers are lost in antiquity, before the dawn of Hinduism, Jainism or Buddhism. The cosmologies and origin myths of each of these religions speak of Kailash as the mythical Mt. Meru, the Axis Mundi, the center and birth place of the entire world. The mountain was already legendary before the great Hindu epics, the Ramayana and the Mahabharata, were written. Indeed, Kailash is so deeply embedded in the myths of ancient Asia that it was perhaps a sacred place of another era, another civilization, now long gone and forgotten. 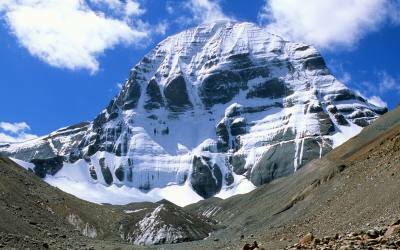 Hindus believe Mt.Kailash to be the abode of Lord Shiva. Like many of the Hindu gods, Shiva is a character of apparent contradictions. He at once the Lord of Yoga and therefore the ultimate renunciate ascetic, yet he is also the divine master of Tantra, the esoteric science that regards sexual union as the most perfect path to spiritual enlightenment. According to legend, immortal Shiva lives atop Kailash where he spends his time practicing yogic austerities, making joyous love with his divine consort, Parvati, and smoking ganja, the sacred herb known in the west as marijuana, Hindus do not interpret Shiva’s behaviors as contradictory however, but rather see in him a deity who has wisely integrated the extremes of human nature and thus transcended attachment to any particular, and limited, way of being. For a Hindu, to make the arduous pilgrimage to Kailash and have the darshan (divine view) of Shiva’s abode is to attain release from the clutches of ignorance and delusion. Kailash is sacred to other religions as well. The Jains call the mountain Astapada and believe it to be the place where Rishaba, the first of the twenty-four Tirthankaras attained liberation. Followers of Bon, Tibet’s pre-Buddhist, shamanistic religion call the mountain Tise and believe it to be the seat of the Sky Goddess Sipaimen. Additionally, Bon myths regard Tise as the sight of a legendary 12th century battle of sorcery between the Buddhist sage Milarepa and the Bon shaman Naro Bon-chung. Milarepa’s defeat of the shaman displaced Bon as the primary religion of Tibet, firmly establishing Buddhism in its place. While the Buddha is believed to have magically visited Kailash in the 5th century BC, the religion of Buddhism only entered Tibet, via Nepal and India, in the 7th century AD. Tibetan Buddhists call the mountain Kang Rimpoche, the ’Precious One of Glacial Snow’, and regard it as the dwelling place of Demchog (also known as Chakrasamvara) and his consort, Dorje Phagmo. Three hills rising near Kang Rimpoche are believed to be the homes of the the Bodhisatvas Manjushri, Vajrapani, and Avalokiteshvara. Pilgrims to Kailash, after the difficult journey getting there, are then confronted with the equally arduous task of circumambulating the sacred peak. This walking around the mountain (clockwise for the Buddhists, counter-clockwise for Bon adherents) is known as a Kora, or Parikrama, and normally takes three days. In hopes of gaining extra merit or psychic powers however, some pilgrims will vary the tempo of their movement. A few of them, practicing a secret breathing technique known as Lung-gom, will power themselves around the mountain in only one day. Others will take two to three weeks for the Kora by making full body prostrations the entire way. It is believed that a pilgrim who completes 108 journeys around the mountain is assured enlightenment. Most pilgrims to Kailash will also take a short plunge in the nearby, highly sacred (and very cold) Lake Manosaravar. The word ’manas’ means mind or consciousness; the name Manosaravar means Lake of Consciousness and Enlightenment. Adjacent to Manosaravar is Rakas Tal or Rakshas, the Lake of Demons. Pilgrimage to this great sacred mountain and these two magical lakes is a life changing experience and an opportunity to view some of the most magical scenery on the entire planet. Lying 20km southeast of Mt. Kailash and north to Namnani Peak, Lake Manasarovar is the highest freshwater lake in the world, with an altitude of 4,588 and an area of 412sqkm. 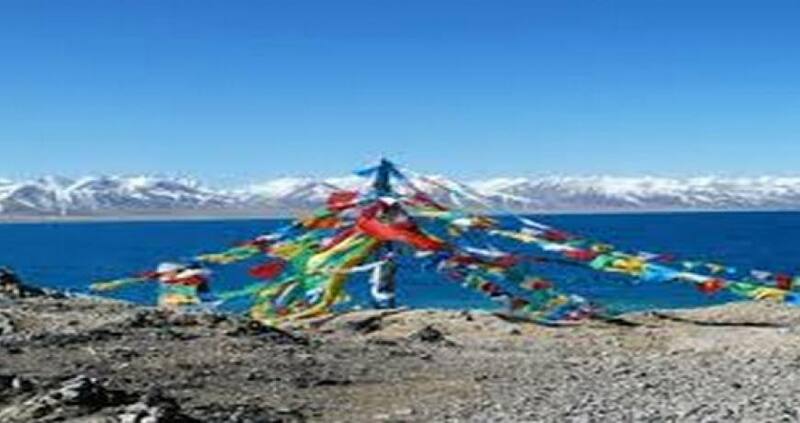 Lake Manasarovar, "Mapam Yumco" in Tibetan, means the "eternal and invincible jade lake" named to mark the victory of Buddhism over the local Bon Religion in the 11th century. It is Tibet’s most sacred lake and is holy to both Buddhists and Hindus. Xuan Zang(600-664AD), an eminent monk of the Tang Dynasty (618-907), described Mapam Yumco Lake in his book Records of Western Travels as "a jade pond in west". Early legend has it that there are countless treasures at the bottom of the Lake Manasarovar. Hindus and Buddhists alike believe that the Lake Manasarovar has the power to cleanse away a person’s sins, either by drinking (Tibetans) or bathing in the water (Hindus). Many pilgrims come to Lake Manasarovar to be healed of their illnesses. Lake Manasarovar enjoys a reputation equal to the holy Mt. kailash. Indian legend claims it to be a place where Siva and his wife Goddess Woma, daughter of the Himalayas, bathed. Tibetan legend claims it to be where the God Guangcanlong lived. In Buddhist scriptures, the lake is named the "mother of the rivers in the world". There are 9 monasteries surrounding Lake Manasarovar. Gyiwu Monastery and Curgu Monastery are the best known of them. 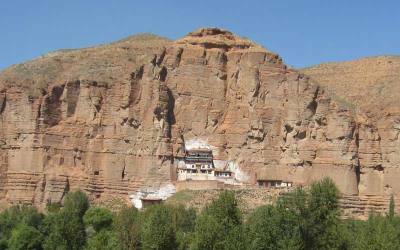 The area surrounding Curgu Monastery is respected as a holy and pure bathing place. The holy properties of the lake notwithstanding, the beauty and tranquility of the lake is enough to soothe a weary soul. Lake Manasarovar and Curgu Monastery are reachable from Darchen(Ta’erqin), which is 30km to the south. Alternately, hitchhiking along the main Ngari-Burang Highway can get you to a point 6km from the lake. Walk southwest from the highway to the lake. There are two hostels opened by Tibetans in the small villages near Jiwu Temple. No restaurants near the attractions. The hostels provide plain rice and vegetable dishes. Travelers better bring some instant noodles or solid food. There are furnaces and dry cow dung that can be used for burning, you can cook by yourself. Q. 02: How we will be doing 15 days Yatra? - Kathmandu to Kodari (Nepal - Tibet border) tourist bus will be used. In Tibet, 4500 cc Toyota Landcruiser will be used. Routing Kathmandu-Zhyagmu-Nyalam-Saga-Paryang-Mansarovar-Darchen Dirapuk-Zuthulpuk-Darchen-Paryang-Saga-Nyalam-Kathmandu. - Kathmandu - Nepalgang - Simikot - Hilsa (by helicopter) - Taklakot - Mansarovar - Darchen - Dirapuk - Zuthulpuk - Darchen - Mansarovar - Taklakot - Hilsa - Simikot (by helicopter) - Nepalganj - Kathmandu. A. If you do not want to trek you can hire horse/pony for parikarma. Parikarma (kora) that is for 3 days. It will cost you approx. Yuan 1000 per Yak with Yak man. - Airport tax of Kathmandu. To be paid cash direct at the airport while taking return flight. A. In Kathmandu you may use USD OR Indian Currency (however denominations of INR 500 & 1000 is not allowed in Nepal). For Tibet you will need Chinese Yuan only. for 14 days in Tibet we suggest you to carry approx Yuan 2000 Per Person. Which you may need for emergency and to pay for horse during Kailash Parikrama. Balance (unused Yuan) may be exchanged again on the way back. 30 days before departure date, 20% will be charged as cancellation. 15 days before departure date, 50% will be charged as cancellation. • Oxygen Back-up & Gaymo Bag. A. Yes, you can get helpers/porters for your kids/luggage, the charge may be approx Yuan 150 per day. A. Water bottles / pure natural mineral water may be made available. A. Darchen (base camp of Mt. Kailash) is the last point where communication facility is available. Mobile will not work in Kailash region. It works only in town. Our guides will be using satellite phones during parikrama. Q.30: Is there any pandit available? A. No, we do not have any age restrictions. If you are physically fit you may travel but we insist every one to consult their doctor and must mention that you are going to high altitude. Couple of old aged people travelled with us and have successfully done the parikrama. 3 night’s accommodation at 3 star hotel in Kathmandu with bed and breakfast on twin sharing basis. Sight seeing tour in kathmandu valley by private transportation with English speaking guide. All the Ground transportatin in Tibet by Toyota Land Cruisers or bus as applicable. Services of English speaking Tibetain and Nepali guide in Tibet. Services of all the trekking equipments and necessary staff. Rescue and evacuation or all the extra cost because of partition from the main group or serious health condition. All the entrance fees in temple of kathmandu valley.